Is No Taste the New Taste? Now then ladies and gents. It strikes me that the general zeitgeist in fashion at the moment is to do bad taste. And I don’t mean ironic, tongue in cheek, let’s all have a bit of a laugh Henry Holland bad taste* (*more of him later) but actual real in your face ‘am I a bit offended’ bad taste? Fashion and art should always be about pushing the boundaries of creativity but when you push that outer limit to taste itself, then what is acceptable? Is No Taste the New Taste? Steven Meisel’s latest ‘Water & Oil’ shoot in Vogue Italia is the ultimate example. Incredibly beautifully photographed and certainly making a statement about the world we live in, is it also making a statement about the extremities of taste and acceptability? 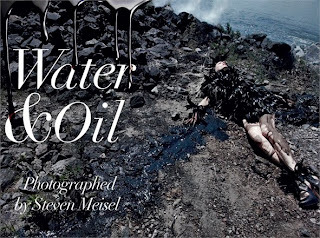 Kristen McNemany is cast as the protagonist of a news story, the dying seal, the lifeless form, covered in oil her body becomes the symbol of the tragedy. The fact exists that she is also wearing thousands of pounds worth of designer lables and captions highlight product (as it is a fashion magazine, after all). It seems like highlighting oil consumption and the disaster and pairing this with designer fashion and art is a tad like not knowing where the taste barometer is. I’m in two minds about this. Is it all just a bit too raw? What next? The Pakistani flood shoot? While I can applaud the brave decision of Vogue Italia’s editor in chief, Franca Sozzani (one of my heroines incidentally) to break boundaries, perhaps the acceptability of this shoot raises too many other questions. Earlier this year, our own Dame Vivienne launched a menswear collection in Museo della Permanente, Milan with some models carrying bedrolls and some emerging from cardboard boxes. The Westwood models were supposed to look like rough sleepers. Homeless chic must surely be the epitome of bad taste? Zoolander come to life. Then there’s Victor & Rolf’s early ‘Black Hole’ collection (from A/W 2001/2) where models faces and hands were blacked out. Making a fashion statement or offending a minority? Certainly the design duo, Victor & Rolf, become more well known following this. It all leads me to think, are these examples a fashion oversight or a move to shock? Now back to Mr Holland. It appears he is,once again, furthering his brand remit and launching a line of Hair Care products in the zany House of Holland style with Sebastian Professional. While they look great, the fact they are based on a fashion collection inspired by a ‘down-town Harlem ghetto girl’ seems a bit off, frankly. It may look fun and upbeat and quirky but is basing a design concept and mass market products around poor black people in the projects of New York now acceptable? Again, I’m rather in two minds with this one. I’d love to hear your comments. Please leave a comment in the box below or in the ‘shout mix’ box opposite. Next post: Bastyan. Pure feminine fluid covetability.